You can select up to 15 travelers in total. 1 item added to cart! A DIY day trip to Kandy from Negombo alone usually means changing trains in Colombo. This private tour lets you visit the hill country city hassle-free, and with a driver-guide for background. 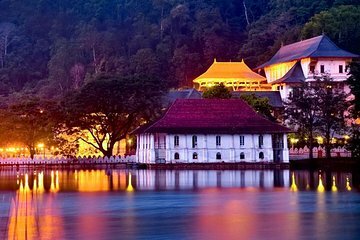 On arrival, experience Kandy’s attractions, including the Tooth Temple, market, botanical gardens, and a folklore show. A possible visit to Pinnawala’s Elephant Freedom Project on route, plus return hotel or Colombo airport transfers makes the day complete. Godfrey our guide was very good he took us to see lots of great places and good places for lovely views. Pinnawala Elephant sanctuary was not on the itinerary but we enjoyed the visit - it was good to see the elephants in the river and we enjoyed a good cup of tea in the hotel overlooking the river.